Julie Delpy graced the red carpet on Sunday (March 2) at the 2014 Oscars, hosted at Hollywood’s Dolby Theatre. 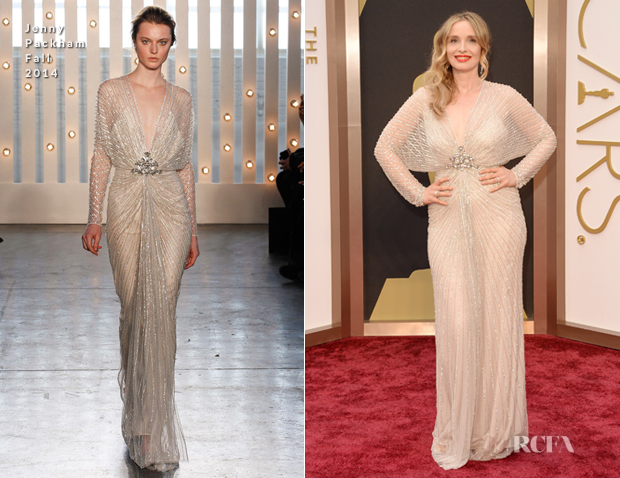 The ‘Before Midnight’ actress sparkled in a Jenny Packham Fall 2014 design. Julie seemed to be inspired by flapper-era style when she chose her shimmering gown. The deep neckline and cinched waist, complete with a crystal detail, showed off the actress’ hourglass figure in the most lovely way. Chopard jewels and a Jimmy Choo ‘Carmen’ clutch were the perfect accessories. In theme with the 1920’s style, Julie chose a soft wave and red lip combo that paired beautifully with her dress. I think Julie nailed the classic bombshell look. Do you?